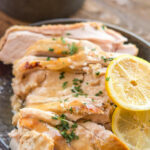 If you’ve ever wondered about how to make a turkey breast without the hassle, try this Slow Cooker Turkey Breast! 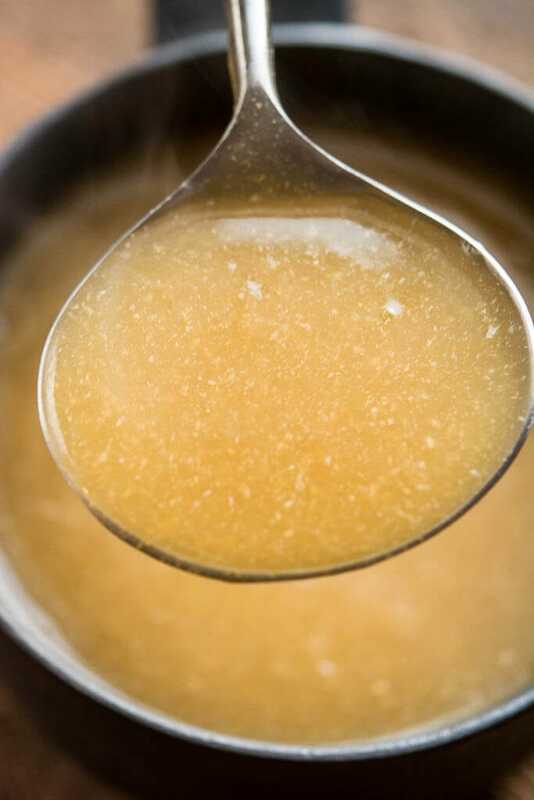 This recipe uses only 4 ingredients and is simple, juicy and delicious. 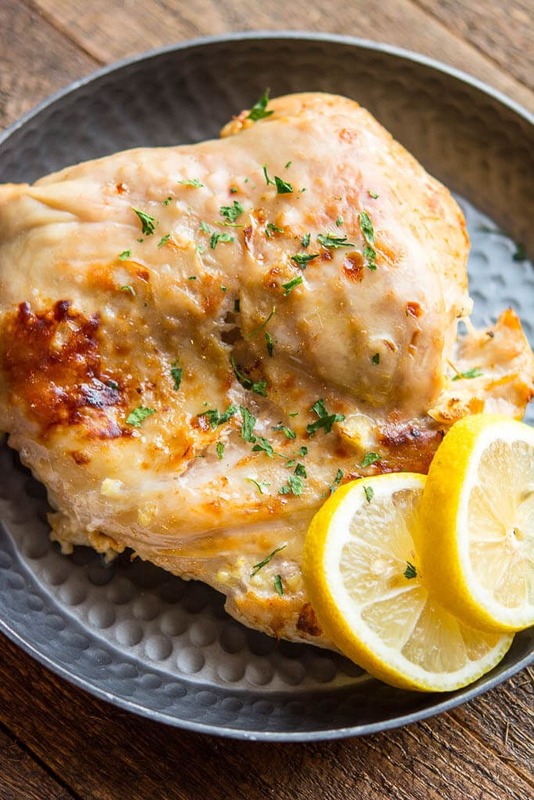 Perfect for a holiday celebration or a weeknight meal! A few years back my friend Amanda invited us to her house for a pre-Thanksgiving Thanksgiving dinner (Amanda are you reading this? This is a tradition we need to reinstate ASAP!). This was way before I had my food blog but was still obsessed with cooking, recipes, etc. I’m pretty sure my big contribution that year was brussels sprouts, but she made the turkey and it was the star of the show! She made it in the slow cooker, and I was VERY impressed. My Mom makes an amazing Thanksgiving turkey but this slow cooker turkey gave Mom a run for her money. 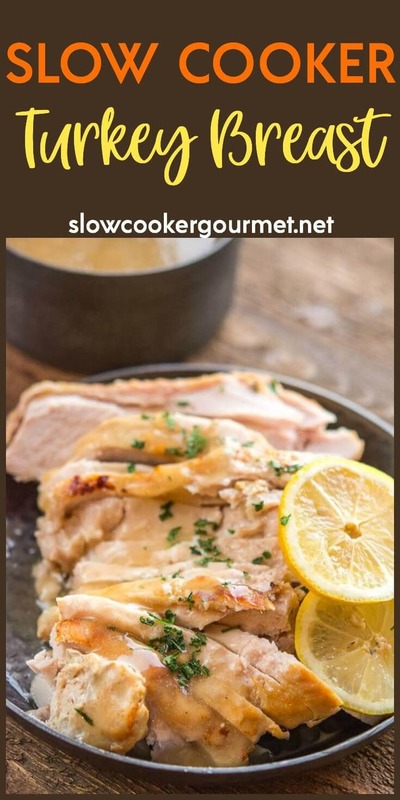 Plan on making this Slow Cooker Turkey Breast Today! Simple, Quick and so EASY! What took me so long to finally share this recipe here? I have absolutely no idea but let’s just be glad I finally have! I asked her the other day if she would be okay with me sharing the recipe and she so graciously agreed! So let’s just call this Amanda’s Famous Thanksgiving Turkey and let’s all make sure we host or attend a pre-Thanksgiving Thanksgiving event. It’s only fair to get our stomachs all warmed up for the big day, no? You know how I can get a little carried away from time to time trying to add herbs or cream or something to just about any recipe. But I didn’t change a thing here and it turned out perfectly. So juicy and full of flavor! Sometimes the simple delicious goodness of a perfect recipe is all you need. Well, that, and gravy. Obviously. 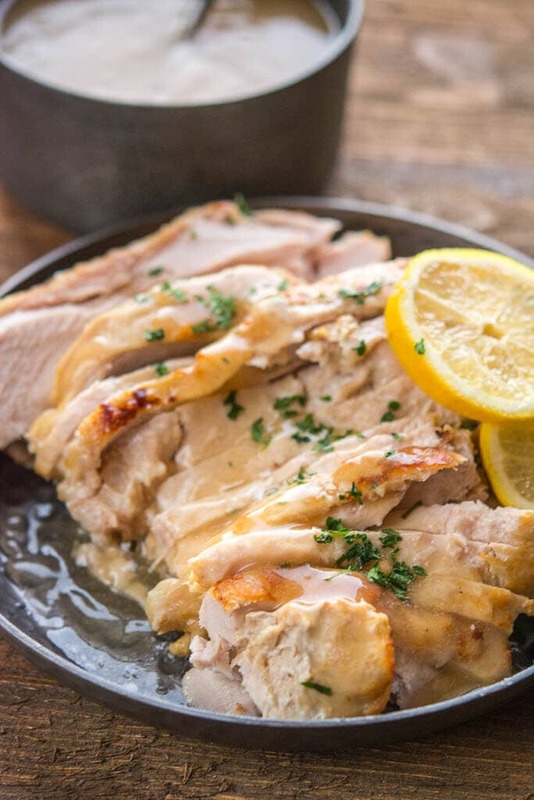 See Recipe below for the too easy gravy made with this Slow Cooker Turkey Breast. If you are looking for a side dish for Thanksgiving here are a few of my favorites! 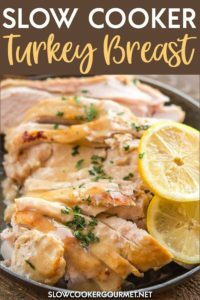 If you've ever wondered about how to make a turkey breast without the hassle, try this Slow Cooker Turkey Breast! This recipe uses only 4 ingredients and is simple, juicy and delicious. Perfect for a holiday celebration or a weeknight meal! Cover and cook on low for 8 hours and don't open the lid! To give turkey a crispy skin finish, line broiler pan with foil and place turkey on it skin side up. Broil in oven for about 5 minutes or until lightly browned. Watch it closely so it doesn't burn. I have a boneless 1.5 skinless turkey breast. How long should I cook it and can I add carrots, celery, and potatoes? I would start checking the internal temp of the turkey at about 6 hours on low and ensure it has reached 165 degrees F. And yes, those additional will be fine although you may want to add them about half way since it has so much liquid you don’t want them to overcook. Awesome!! So glad you loved the food and got to enjoy your day! I retired a few months ago and have decided to pull my Slow Cooker out of the cupboard So far I have done stews, beef roasts, pasta & sauce and I’m going to pick up a 3lb turkey breast tomorrow and give this a try. You will love this!! And it’s awesome for leftover turkey sandwiches too!! Hi! Your recipe looks delicious and I’d love to try it! The only problem is in my city in Spain thinley sliced turkey fillets are what’s most readily available. Could I use those in the crockpot instead and just change the cooking time? I would put about 14 slices in the crockpot. I think that should work! I’m not sure how much less time it will take but they should still turn out very flavorful! Hi Cheryl! I have not tested it on high for 4-4.5 hours so I don’t want to tell you it would be fine and then have it not turn out. My recommendation is the 8 hours on low. Hope you enjoy it! If I make this recipe with an 8 lb turkey breast would I then basically double all the other ingredients too? Yes, you would just double the ingredients since you are doubling the size of the meat. Hope you enjoy it! With the 8 lb breast, would you still cook for 8 hrs on low or longer? If it’s bone-in I would start it out on high for 1-2 hours at first. The most important thing is to make sure the turkey breast reaches and internal temp of 165 degrees F.
Hi Jennifer, if I cook 2 of the 3 lb turkeys in the same crock pot, will they both cook in 8 hours? Hi Elena! Yes, they should. Just make sure you use a the right size of slow cooker, meaning it should be about 2/3 full to cook properly (probably a 5-6 quart). Of course, always check with a meat thermometer for proper temperature, but you should be good! Hi Jennifer, my name is Bernadette and I am also a food Blogger my daughter helps me run my page. You have inspired me to bring out my slow cooker and I have been having fun. Especially on a Saturday when the family comes to visit. I now put on my slow cooker early in the morning and by the time 1 o’clock comes we have a tasty main dish ready and I have just had to quickly make the vegetables and salads to go with. It gives me more time to spend with visitors and family. Thank you. Enjoy reading your comments and recepies. I know I have tried one pulled skirt steak . It was devine and went down a real treat. Slow cooker turkey breast is my plan for this Thanksgiving, so I was really excited when I received your e-mail. I just have one question. 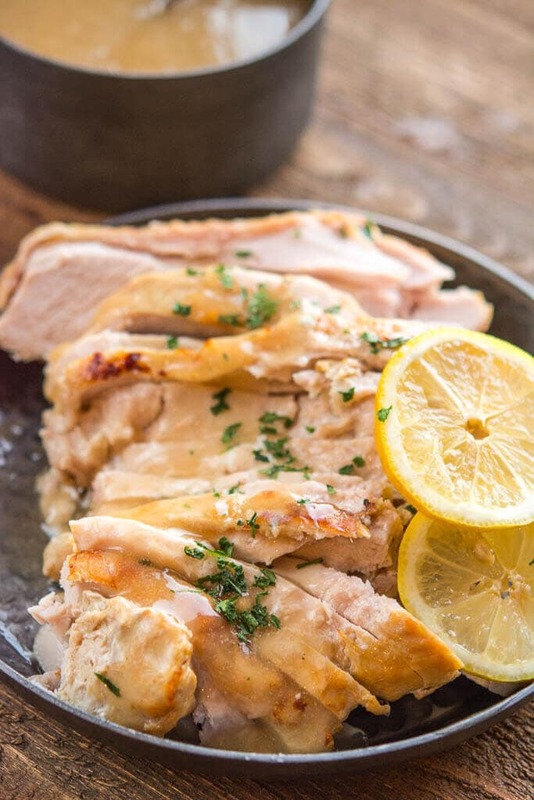 Your recipe says to “… lay flat in bottom of slow cooker.” Is this breast side up or down? I am thinking breast side down for more juiciness. Many thanks in advance. Love your blog! Hi LaWanda! This was a breast only piece so it’s all wrapped up in netting. So what I did was take all the netting off and then I place it skin side up in the slow cooker so that the skin would brown up just a bit and not get soggy. You can also place it under the broiler for a few minutes as well when done cooking to crisp it up… I will add that note!